International Women’s Day 2019 once again became a day of struggle around the world. It is, however, difficult to get an overview of all protests writes Elin Gauffin from Rättvisepartiet Socialisterna (sister organisation of the Socialist Party in Sweden) . In some countries, the movement has declined somewhat while at the same time, new movements have emerged in other countries and in others again, it was bigger than ever. In Spain, the feminist strike was enormous, even larger than the last two years. According to the UGT trade union, six million left their jobs and went on strike for at least two hours. This is a union that has tried to hold back struggle but that was forced to announce a two-hour strike with the other major union, CCOO. Other more radical unions like CGT, Cobas and CNT have been pushing for a 24-hour strike and they claim that seven million workers were involved in the feminist strike. More than 2.5 million school and university students participated in the school strike that continued throughout the day. The teachers’ unions’ federation estimated that more than 80 percent of the students at universities went on strike and 61 percent of upper secondary students and 42 percent of lower secondary and primary school pupils walked out of school. The socialist students’ union, Sindicato de Estudiantes, and the socialist feminist platform, Libres y Combativas, celebrated the fact that 350,000 young people responded to their call to take to the streets. It affected all cities with thousands, tens of thousands and even hundreds of thousands (in Barcelona and Madrid) taking part. In the evening, the demonstrations with young and old together grew even larger, in over 500 locations in the Spanish state. The demonstrations in Madrid with 350,000 and in Barcelona with 200,000 were also bigger than last year. The fact that Spain has a social democratic PSOE government has in no way dampened struggle. If PSOE thought it would be easy to dampen struggle by appointing more female ministers, they made a fatal mistake. ”We have 1,000 reasons” was one of the main slogans in Spain on 8 March, that is, 1,000 reasons to demonstrate. An important demand for young people is a new curriculum that addresses stereotypical gender roles influenced by religion. There are elections in Spain on 28 April and the growing extreme right-wing party, Vox, has found support among the right of the conservative PP and reignited old debates, debates that all had thought were already won. The right is planning attacks on abortion rights and wants to tear up the law against domestic violence, but this has obviously not been accepted by the millions on the streets. 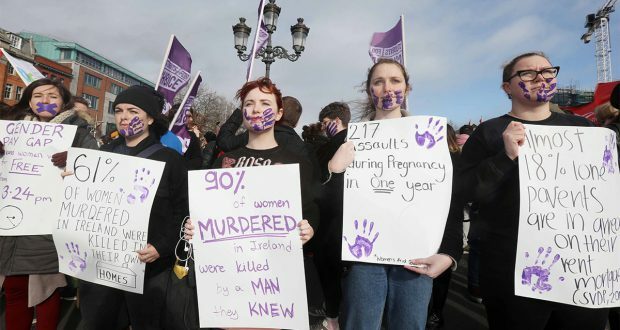 Even in our neighbouring country, 8 March was bigger than ever thanks to the new government’s plans to attack abortion rights. In Oslo, 14,000 marched on a demonstration which grew to 20,000 at Youngstorget. This meant that the demonstration was not just larger than at the highpoint of 2014, but also larger than at the peak of the 70s women’s movement in 1975, “International Women’s Year”. Albert Andersen Øydvin explained that it was the old women’s organisations like Kvinnofronten [Women’s Front] that arranged things but that there were a lot of young people out demonstrating and with a lot of energy. No clear message was given about how struggle can move forward but it must do so now when the government is trying to get restrictions on abortions rights pass in the parliament. In Belgium ROSA, the socialist feminist platform, had a large and vibrant block in the demonstration. Here, women’s struggle has grown gradually in recent years – 8 March has not been a particularly big day previously. In Germany, there was a call for a feminist strike. No major strikes took place but pressure from below led, however, to the city of Berlin announcing a public holiday and 20,000 attended the largest 8 March in a long time. Around 50,000 demonstrated throughout Germany. In Belgium, the movement for a feminist strike has also grown and the idea has been raised by some official unions. On 8 March, 10,000 took part in the demonstration in Brussels. The socialist feminist organisation, ROSA, represented the largest and most vibrant block with 500 participants. In Gent, ROSA organised a demonstration with 800 people. The trade unions, CNE, CGSP and some local unions organised minor symbolic strike action. CNE had a strike call for women only (it would had been better and bigger with a strike call for all), while the other unions organised smaller and symbolic strikes for both men and women with the main demand for a €14 minimum wage. All of the so-called grassroot trade unions in Italy responded to the call from the women’s movement, Non Una Di Meno, to organise strike action. 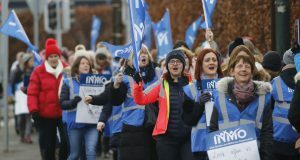 Workers went on strike at hundreds of private workplaces across the country, but above all in the transport and public sectors and in the schools. For example, in Bologna, half of the city’s buses stood still. In the evening, hundreds of thousands of people gathered in all major and minor cities against gender-based violence, against insecure employment, and against the government’s racist and anti-feminist policies. Their main anger was directed at Prime Minister Salvini. Resistenze Internazionali, the CWI in Italy, reports that the strikes and demonstrations were both better organised and more widespread than during the previous two years. 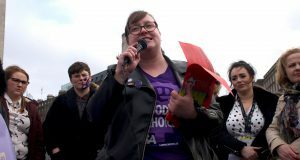 ROSA and the Socialist Party (CWI Ireland) campaigned for the movement that included last year’s victory on abortion rights, spontaneous demonstrations against sexist judges’ verdicts and the nurses’ strike to take a step further with work stoppages on 8 March. Only one union, Unite, supported the call – but they did not mobilise for it. It was therefore more a case of symbolic strikes in some schools and universities. In Dublin, ROSA organised an hour-long blockade of the largest bridge in the city centre which was well reported in media. The pictures from Istanbul look as powerful as they did last year with tens of thousands or more on the streets, with demonstrations in Diyarbakir and Ankara as well. The movement against the deadly violence against women has been going on for several years, provoked by the hatred of women that Erdoğan’s government nurtures. ”Feminist revolt against male violence and poverty” and ”I was born free and I shall live free” were some of the slogans. The fact that the demonstrations are so large is impressive given the strict laws that restrict freedom of expression. In Istanbul, women were brutally attacked by the police with dogs and tear gas. Large demonstrations also took place in Algeria and this is something new. In recent months, women have played an increasingly important role in the movement against President Abdelaziz Bouteflika who, old and in ill health, is trying to cling to power. The 8 March demonstrations in Algeria demanded freedom, democracy, dignity and an end to corruption. Marielle Franco, socialist and LGBT-activist murdered by the far-right 14 March 2018, was remembered this 8 March in Brazil. The strongest women’s movement in recent years is in Latin America where struggle is constantly thrown back by new setbacks, only to pick up momentum again in the face of massive attacks and go on to win new victories. The movement against the deadly violence in Mexico has been on the rise in recent months and was also large on 8 March. The biggest newcomer when it comes to mass struggle on 8 March must be Chile. According to CNN, a 4-kilometer demonstration made its way through Santiago with 190,000 participants, well above the organisers’ expectations. In Uruguay it was not as big as recent years because the unions didn´t organize the strike. Still, 50 000 came to the demonstration in Montevideo. The women’s movement has won law improvements in recent time. The main slogan now was pointed against fascism and the attacks from the right all over the continent. The women’s movement against violence, Ni Una Menos, was born in Argentina and this year parts of the country were again stopped on 8 March, as was also the case for the past two years. The demonstration in Buenos Aires was called for 5pm, but people already started arriving at lunch and so many that came to the demonstration were forced to divide up into a number of mass demonstrations that marched through the city. In Brazil, workers’ and women’s struggles have been attacked by the growing right and Bolsonaro’s shocking election victory last year – which, in turn, has been answered with renewed struggle. The CWI’s section in Brazil, LSR, reported that tens of thousands demonstrated on 8 March in major cities such as São Paulo, Rio de Janeiro and Belo Horizonte. The main slogans were against Bolsonaro, pension reforms and violence and to the memory of Marielle Franco. On 14 March, it is the anniversary of the right-wing murder of Marielle Franco who was a socialist, LGBT activist and a fighter for thousands. In many other countries around the world, there were demonstrations of varying sizes on 8 March such as in India, Hong Kong, Cambodia and the US. The network that organised feminist strikes has, according to Feministiskt Perspektiv, said that there were coordinated actions in 46 countries this year. In Iran, there were many small protests – even one-person protests – on the streets by feminists who held speeches or dared to pull back their veils. The women and the labor movements in the world proved strong on March 8, a day that historically has had a revolutionary significance. March 8 gave a good foundation for continued struggle the rest of the year.